House your equipment with the Middle Atlantic DRK 19x42x77" 44SP Rack with No Rear Door and Cage. 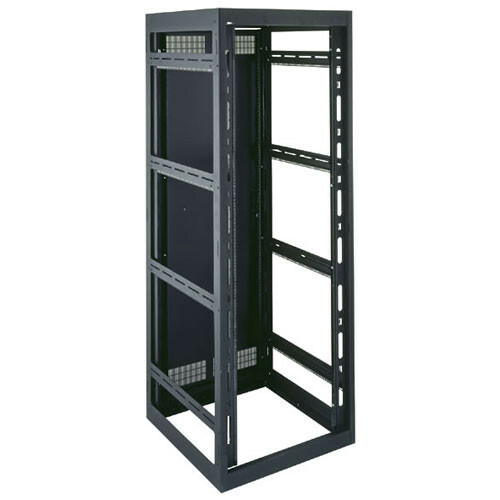 This rack securely and attractively holds your expensive equipment. Electrical knock outs on rear plates easily allow for cable pass through. These racks come standard with vented rear doors. The top is built to accommodate a 10" fan and comes with a fan guard for additional ventilation. Fully welded construction provides 2500 lb weight capacity and when used in conjunction with the MRK-Z4 brackets the DRK is even seismic certified for up to 750 lbs of essential equipment. Protect your equipment cables with Middle Atlantic's electrical knockouts and cable ducts for security and safety. Get the ventilation you need with vented rear doors, fan guard and optional fan for increased air flow and front door options that can provide even more ventilation if desired.